When it comes to hair care and life in general, we ask for two things: inspiration and solutions. Inspiration to compel us to try something new every day and the solutions to all of our most pressing problems (or complaints, if you must). This is why we are stoked to see that the Noisettes' lead-singer extraordinaire, Shingai Shoniwa, is the celebrity ambassador for Mizani hair care. 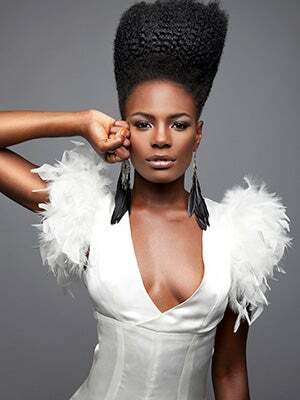 Shoniwa is as famous for her electrifying performances as her bold and dramatic sense of style. Oh, and that hair. A tidal-wave-like mane with nary a strand out of place, it’s seems a perfect fit for a range like Mizani, which focuses on hair-care needs for curly, textured, African-Caribbean, and mixed-race hair. As the singer says, “I love to experiment and I’m constantly changing my style, so the Mizani range is perfect for me.” With performances scheduled for March and a new single out in April, we can’t wait to see what Shingai and her perfectly coiffed barnet do next. Inspiration and solution? Both found in one place. Thanks Mizani.